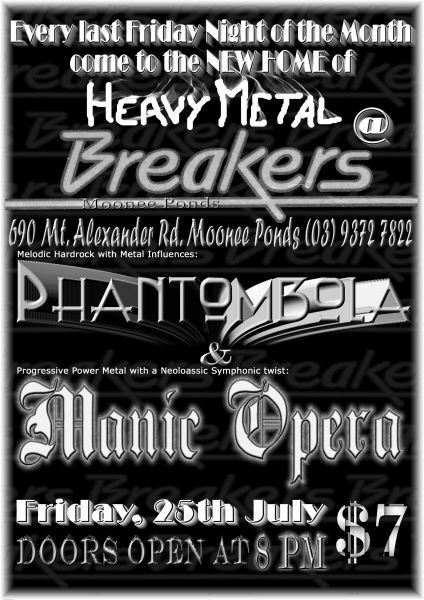 After the "test-run" gig in May, the first "official" Breakers Metal gig was held on Friday 25th July, and was to feature Phantombola and Manic Opera. Unfortunately, due to an emergency cancellation, Phantombola were left to go it alone. All was not lost, however, as the boys put on a great show, and with the metal tracks spinning before and after, people soon chilled in the club atmosphere. We had over 100 people - which was great, since most knew of the cancellation. Phantombola (now PTB) really proved they are an up-and-coming band, with plenty of talent and drive. This was one of their first gigs, and even the fact that they had to entertain the crowd alone did not seem to phase them. Their brand of "Pitbull terrier Rock (with a Heavy Metal collar!)" is easy get into. For those that like their music punchy and direct, but with some modern sophistication ala samples and keys, I highly recommend checking them out in the future! If you want to check out some pics of the night, click here!